This year Disneyland introduced “Valentine’s Month” to the park with extra decor, special food items, and even a scavenger hunt to celebrate the holiday of love. I’ve always enjoyed a good scavenger hunt, so Patrick and I went over to the park for the day to experience it. For those familiar with Disneyland’s Easter Egg Hunt, Minnie’s Valentine’s Day Surprise is very similar. After purchasing ($6.99 plus tax, but annual passholders receive their discount) the sheet of clues and stickers to apply, Guests roam the park in search of the valentines that Minnie has given various characters. 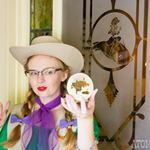 I was thrilled to spy Slue Foot Sue and Pecos Bill as part of the hunt! Not only because Slue Foot Sue is my favorite character, but also because I chose to wear my Valentine’s Day pin featuring them! At the end Guests return to the Disney Showcase along Main Street and receive their prize, which is a box valentines like the ones scattered about the park! Guests can choose one pack from two different offerings, so in order to collect all of the valentines Guests must purchase two clue sheets, which we did. Valentine’s Month runs through February 18th. To learn more visit the Disneyland Resort website. And another gorgeous pink dress! I love this one too! The silhouette fits you perfectly and I love how you have accessorized it.